Because the way you worded your post made it sound like Senna chose to leave Williams for a better team rather than Williams not being particularly interested in renewing his contract. I personally don't understand the love fest for Bruno on these forums. Yes, he's driven consistently and had a couple of good races, but he's hardly shown any true promise or spark of being able to elevate his game. Maldonado has shown much better pace and has calmed down towards the latter half of the season. Good for Bruno if he gets another seat, but frankly it would be a waste of a seat imho when there are so many more capable drivers who are fighting for a seat for next year. Leaving all that aside, it is interesting that Lotus is taking so freaking long to make a decision on their 2nd driver. Presumably they are the ones who hold the key to next years driver lineup as everyone is waiting to see who they pick. Grosjean must be really sweating it out at this point. I think Heikki has been found out this year, and most people have discovered they'd been giving him too much credit for beating Trulli. As soon as Petrov settled in he had a handle on Kovy. That's why no big team seriously looked closely at him for a 2013 seat, even though Ferrari, McLaren, Mercedes and Lotus have/had seats to fill. What happened to the Kobayashi/Lotus link? I think Lotus would take Kamui over Heikki or D'Ambrosio. My only guess about Kobayashi not being linked with Lotus in that report is that maybe, his fund raising/sponsor search might be far enough behind that Lotus wouldn't want to wait that long before making a decision (seems like Grosjean expects a decision this week). It's one thing for a Caterham to give Petrov a seat very late, but Lotus has higher expectations and such a late decision could mean points in 2013. But that's only my guess, as well as not knowing just how accurate that Totalf1 report is. I know it was a much different view than I thought to be the case based on all the rumors and different reports. I figured Senna would as well be in the Lotus picture. It would be very funny if Ma went to Caterham! It was pretty clear Bottas would be in Williams for 2013, when he signed to contract to get him 15 FP sessions last December. Bruno had a choice take the Williams contract or end his F1 career as the deal for him was only done in January, he was driving this season to keep him in the shop window for other teams as Williams was expecting a rebuliding year and wanted to get Bottas decent F1 mileage in a low pressure situation, but they didn't realise how good the car would be! For Lotus if they were the options, I'd pick Grosjean every day of the year but give him a "final warning" and have a race ready driver on the sidelines. People forget he got 3 podiums (Webber only got one more!) and has shown good ability to work the tyres in Q and race when he keeps it on the island. France is about to get their F1-history's 72nd racing driver when Jules Bianchi takes the pole in Force India's election as teammate to Brit Paul di Resta. Bianchi has this season been Force India's practice- and spare-driver just like Valtteri Bottas has been in Williams. Bianchi drove all and all 9 GP -practice sessions. Bianchi is three weeks older than Bottas. Both are 23-years old and both are born in August 1989. RoGro is confirmed in Lotus, Chilton to Marussia. There are two empty spots now, one at Force India and one at Caterham. There are Adrian Sutil, Jules Bianchi, Sebastien Buemi, Bruno Senna, Jaime Alguersuari, Heikki Kovalainen, Kamui Kobayashi, Giedo Van Der Garde and Vitaly Petrov out there. If di Resta hasn't been confirmed, I assume they'll announce both drivers simultaneously. However, nothing is over 'til the fat lady sings - I don't intend to start any speculation, but until all seats are filled, there's room for it. I find DIR/BIA the most likely combo though. The Caterham seat... no idea. I'd say van der Garde right now, but who knows? I will hope it's Kovalainen all the way. There are two empty spots now, one at Force India and one at Caterham..
Then we can assume that Bruno Senna is going to FI... Otherwise he woudln't have been so happy. And good for him, i think Bruno has shown good potential in the form of good racecraft and overtaking. ******* Actually, up to here (1-6), they are all great choices. I'm ranking retired drivers lower than active drivers. Could DiResta be without a drive for 2013? Possibly, there's been no confirmation of him driving for FI next year, and there are a number of parties confident of seats (Alguersuari, Sutil, Senna) so there could be the possibility that Di Resta's been overlooked! I'd love Kobayashi to get a Force India seat and Senna to get the Caterham seat. I'd be gutted if Kobayashi didn't get a seat. Doesn't mean he'll be in one of the two race seats. true but i would be very surprised if they have him doing pr work when they don't intend to have him as a driver, and he wont go to being 3rd driver. I do think that Di Resta is already secure about his future. Recently he said that he wants to impress the top teams during the next season with F1, in order to achieve a really competitive seat in 2014. Would be a return of the 2011 duo. Hmm.. i have some doubts about this, Sutil is a good solid driver, but his troubled past can have an infulence on the final decision. Interesting. Alguersuari showed good things in the Toro Rosso years, but recently he sounded quite negative about his future plans. As Bruno supporter, i really hope so. Would be a very solid pair of drivers and Senna could have a boost in qualify performances due to new Pirelli tyres. Also, FI needs money due to Mallya's financial troubles, and Bruno brings in a huge sponsorship. This is probably the most realistic scenario. Bianchi is close to Ferrari, and in 2014 Force India will swap from Mercedes to Ferrari engines. Buemi said that he is negotiating with FI. He is surely skilled, but i don't see this as the best solution. Vitaly showed really good things in the second part of the season, outracing Kovalainen, wich isn't exactly a slow driver. I really think that the finn is already out of buisness for 2013, like Kobayashi. Luiz Razia seems to be talking to FI, and he brings also a big sponsorship (not like Senna, but non very far). He is a good driver, but Davide Valsecchi deserves a shot too. At a guess I'd say FI will have Di Resta and Sutil. Seems like their best option right now. Whilst Di Resta is pretty much a dead cert, it's still not official. Would like to see Bianchi given a go at FI, he doesn't have the massive hype he has in 09-10 but he seems quick did well FR 3.5 this season though he should with the experience he has at GP2 level! At Caterham hope Petrov stays. So, if I picked up it rightly, only FI and Caterham have one place each? So many candidates and deserving drivers... Sometimes I wish F1 would have two divisions with same rules. 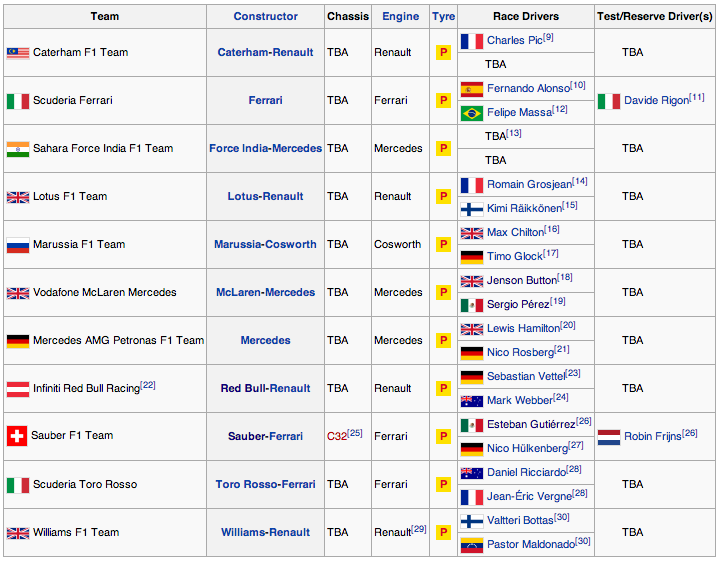 I suspect senna may be preferred for 2013 then making way for bianchi in 2014. I reckon this might be the reason that senna was apparently pushing for a two year deal to try and avoid another Williams situation. But I don't think beggars can be choosers. Algasuari seemed to have problems with his dedication to f1, drivers should have other hobbies but torro rosso didn't seem happy about his DJ work. Seems that Senna and Razia still negotiating hard in order to fill the remaining empty slots. Well, it seems like FI has plenty of choice right now, and they're going to want to pick the driver that fits their needs (which according to Vijay Mallya is fast and consistent). Lots of options to go through, now we'll have to see who puts their name on the contract. Just read a quote from Caterham team principle saying the Caterham seat is between 3 candidates senna, gvg and petrov. They have approached senna and he showed an interest but hasn't committed, only guess is he wants to see if the FI seat is still achievable. Jean todts lad who manages several drivers including Bia claims sutil is out of the running, that 3 people will have a say on the driver slot and majority don't want him as far as he is aware. Petrov to keep Caterham seat its being reported around Russia apparently, Russian helicopters visited Caterham last week and also Bernie has said he wants a Russian driver on the 2014 grid for the Russian gp. Nothing official, it could be another false rumor. Bruno isn't English. I'd take that with a pinch of salt right now. Think that he wanted to say "He will be the first driver in the english team". Caterham aren't English either. Just based there. The tweets make no sense whatever way you look at it.